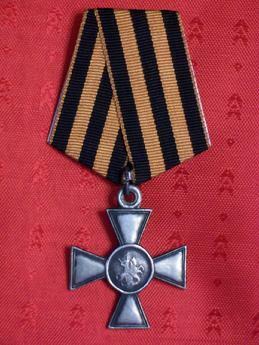 You are looking at a kulm cross also known as the prussian St. George cross instituted in 1839. This cross is frequently confused with the Saint George Cross. 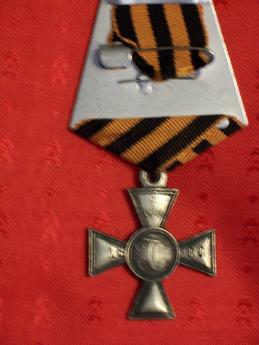 Approximately twenty-five years after the Napoleonic War Emperor Nicholas I presented the Kulm Cross to Prussian troops that had participated at the Battle of Kulm, August, 1813. These were silver and identical on the obverse to the St. George Cross, but on the reverse the monogram of Alexander I appears in the upper arm. And on the horizontal arms, the number. ONLY 4,264 CROSSES WERE PRODUCED, ALL OF THEM WERE AWARDED TO PRUSSIAN SOLDIERS WHO PARTICIPATED IN THE WAR AGAINST NAPOLEON IN 1812. EXTREMELY RARE, LIMITED QUANTITIES!